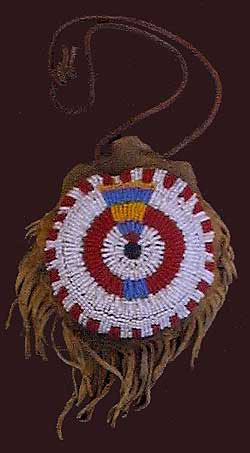 Native Americans made an incredible variety of pouches for every conceivable purpose. 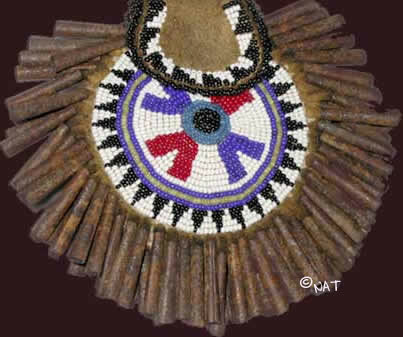 Beaded and or quilled pipe bags were some of the finest items made. Their tobacco was sometimes carried at the bottom of the bag. The pipe bowl was separated when it was carried and a thong drawstring tie was attached to the top of all pipe bags to secure the contents of the bag. lazy stitched completely beaded panel (both sides - approx. 4 x 6-1/4 - overall length is 31 inches (including the fringe) with beadwork down one side, top opening and edges of the ties.